Funny, there’s only two beat reporters here at the Mattick today. Apparently, there’s something going on over at Legends Field in Tampa. I wonder what that could be? Something about some dude named Rodriguez? I wouldn’t know. I cover the Blue Jays. Slow day here at camp, though Marco Scutaro arrived, leaving only Jose Bautista, Scott Rolen and Lyle Overbay as the absent position players from the big league team. Kevin Millar arrived yesterday and we chatted with him today. Check bluejays.com a bit later for a story on that. I’ll also be posting some photos a bit later from Day 1 at camp yesterday. I was having some computer issues and wasn’t able to post them until now. Also just sat down with Cito, and discussed a few things with him. When asked if Bautista and Millar could both make the roster, Gaston said that’s a possibility, adding that it depends on how many pitchers the team decides to head north with. He said the Jays might consider going with one less pitcher at the very beginning of the season. Adam Lind made fun of my graying hair today, and told me I was getting old. Nice, since he and I are pretty much the same age. I asked him if I should dye my hair Dennis the Menace yellow like he’s got going on right now. Not really in a position to make fun of someone’s hair, Lindy. And Travis Snider told me I was a crazy person for running two marathons over the winter. “I don’t think I ran 26 miles all offseason,” he said. Maybe not, but Snider has shown up to camp a bit trimmer and looking like he’s in great shape. He said he’s dropped about 8-10 pounds. In my CD player: Pearl Jam — Vitalogy, because this is my favorite rock album of all-time. Now, don’t mistake me here. I won’t claim this to be the best rock album of all-time — just MY personal fave. Vitalogy was my first rock casette tape when I was a kid and it was what launched my love for rock, especially ’90s grunge. This album never gets old. Flight of the Conchords: Watched it last night and enjoyed it thoroughly. Season 2 has been up and down so far, but the fifth episode was one of the better ones of this season. Last night: Went out and completely embarrassed myself in a round of billiards with the Star’s Rich Griffin. We were playing best of five, and I looked good from the get go. Down to one ball plus the eight in Game 1, and Griff had five left on the table. He went on a run and I never took another shot. Game 2, I was down to the eight ball and Griff had four on the table still. Another run, another loss. From there, my confidence went through the floor and Griff destroyed me. Terrible. Just terrible. Good to see you. How was your offseason? That, in a sense, sums up Day 1 at Spring Training for us scribes. Unless you’re Robby MacLeod of the Globe and you’re feeling extra motivated to run around and do interviews, the first day at camp is basically chilling out, chatting with players and coaches and just enjoying the start of another season. I’m sure Yankees camp is a little different. But, for the most part, the Bobby Mattick is a relaxed atmosphere with a handful of reporters hanging out between the clubhouse and the practice fields. For the beginning of camp, we’ve got myself, MacLeod, Griff from the Star, Sandler from the Post and Elliott from the Sun. Today wasn’t mandatory for any players to be in camp and tomorrow isn’t either. Tomorrow is the “reporting” date, which means pitchers and catchers just have to be in the area. Physicals are on Sunday and the first official workout will be held on Monday. Today, there were some bullpens thrown, some hitters taking BP and some other light drills going on. Most of the pitchers are in camp, and a handful of position players have arrived already as well. Off the top of my head, I spotted John McDonald, Aaron Hill, Russ Adams, Curtis Thigpen, J.P. Arencibia, Michael Barrett, Adam Lind and Travis Snider, as far as position players go. Hill mentioned that I looked “a little beefed up” today, but I quickly corrected him and said, “No, you mean a little puffed up.” I guess taking three weeks off from running — dealing with a right leg issue since my last marathon in january — has helped me pack on a few pounds again. Good thing it’s Spring Training! I’ll be using the next six weeks to whip myself back into game shape, as long as there are so many Minor League deals being tossed around. Speaking of which, the recently-departed Dirk Hayhurst is back in the fold once again. Hayhurst, if you’ve been following closely, was acquired off waivers from the Padres in October — only to be relased earlier this week to clear room on the 40-man roster for Matt Bush. Today, Hayhurst inked a Minors deal to stick with the Jays after all. Chatted with Roy Halladay today about the state of the game and the whole A-Rod steroids admission and you’ll see that story up on bluejays.com today. We also discussed the state of the team and you’ll be reading something on that a little later. As far as the rotation, Halladay did say he wouldn’t mind seeing some of the younger arms stepping up and earning those spots. He also said that, at the end of last season, he thought the Jays were going to be a lot more active over the winter. Halladay said he understands the situation, but he obviously would’ve loved to have seen the club go out and make some big pick-ups, including re-upping A.J. Burnett. 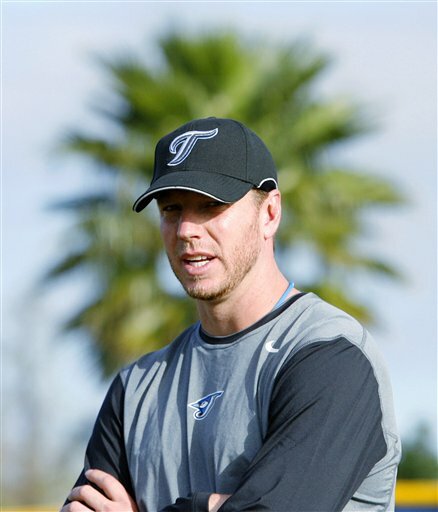 As for his contract situation, Halladay doesn’t want to discuss it with the season being underway now.